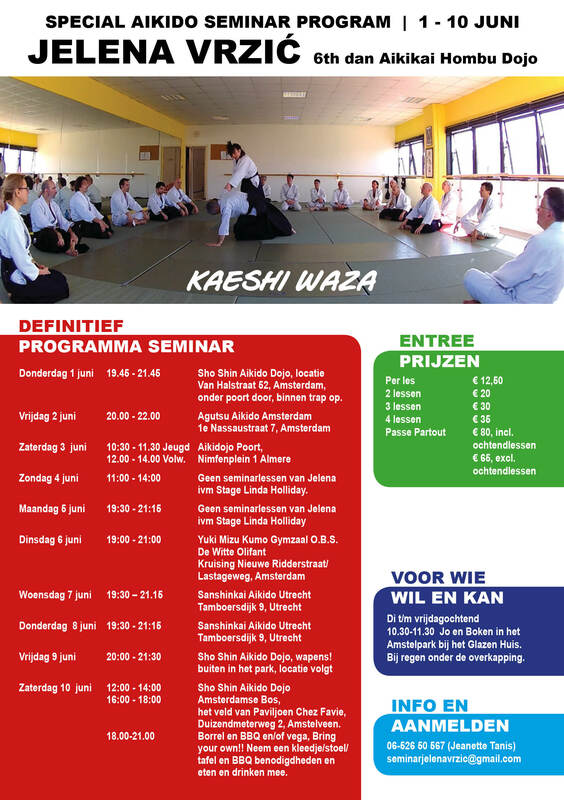 As of Saturday June 3rd up and until Sunday June 11th, Jelena Vrzić sensei will be hosting again several guest trainings in the Netherlands, amongst others also at Sanshinkai Aikido Utrecht. Vrzić is from Serbia and holds the rank of 6th dan and is a student of Tada sensei, 9th dan. Her trainings are exceptionally inspiring, with returning focus on flow, placement and relaxation. The theme is this time kaeshi waza. The training sessions at Sanshinkai Aikido Utrecht are scheduled on Wednesday, June 7th and Thursday, June 8th and admission is open for everybody. The trainings start at 19:30 and last until 21:15 on both Monday and Thursday. Admission is €12.50 for a single training and €20.00 for two trainings. For a complete overview of Jelena’s trainings in the Netherlands, discounts and a combination ticket, please look at the (on 30st of May updated) poster below. Free parking on the grounds at Tamboersdijk 9 and the dojo is also quite easily reached by public transport. Kindly pay your trainings cash on arrival at the desk, and make sure to arrive well in advance.